What do Barack Obama, Derren Brown, Ross Jefferies, Joe Vitale and Michael Stevenson all have in common? If you knew, like they do, that there are certain "magic words" that you could learn to unlock the keys to the inner-minds of people around you, you would do almost anything to learn them, wouldn't you? What if you knew the secret language to unlock success, abundance, prosperity, connection, love and more? What would be possible in your life if you could have the total support of friends, family, even complete strangers everywhere you go? You would have all the success the men above have, wouldn't you? Several 2008 studies have shown that Barack Obama's speech writer used Covert Conversational Hypnosis language patterns extensively to help him win the Presidential Election and become one of the most powerful men in the world. Derren Brown used Covert Conversational Hypnosis for entertainment to have people on the street willingly hand over their wallets, watches and keys, even though they didn't know why. Joe Vitale uses Covert Conversational Hypnosis to make millions in the online internet marketing	world. 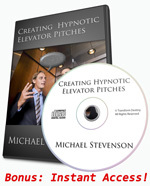 Michael Stevenson is one of the most sought-after hypnosis trainers in the world and has spent years teaching a select group of professionals Covert Conversational Hypnosis in his high-dollar NLP and hypnosis certification trainings. You see, the reason you probably didn't get the raise you want isn't because your employer has no money left. It's because you didn't know how to persuade your boss at the subconscious level to fight for you as a star employee. Your child isn't disobeying you because of society, over-stimulation, too much sugar or the "big bad media." It's because they tune you out and you don't know how to reconnect with the right words that engage them subconsciously. Your sales numbers aren't down because of the economy, but because you're not aware of the words to use to inspire people to abandon their fears and make the purchase. The fact is, there are thousands of things you're missing out on because you don't yet know conversational hypnosis. This is not just about learning some fun "Jedi mind trick." It's about finally taking control and getting the results you want in every area of life by connecting with people around you at the deepest levels of their mind. This is a chance for you to finally feel like you're being heard. You'll learn to connect and communicate with people like never before, so people are riveted to you and hanging on your every word. From that point forward, when you speak, you'll actually be heard and what you say will finally matter. What is Covert Conversational Hypnosis? Covert conversational hypnosis	allows you to connect and communicate with people at a deeper level than ever before to become more persuasive and get the things you want. The conscious mind is like the gatekeeper you find at the royal palace. Its job is to stand guard and protect the subconscious mind from intruders — those concepts and suggestions it doesn't want getting in. But the subconscious mind	is far more powerful than the conscious mind! It makes up a documented 99.994% of your mind, and it's where ALL of our decisions and actions are taken from. If you want to truly influence and persuade people, you must learn to communicate with the subconscious mind. You really can hypnotize people in everyday situations, easily and effortlessly, without them knowing it. They'll feel fully awake and aware, but they'll be under your hypnotic spell the whole time. Including common myths about it and how to use it most effectively. In everyday situations, without their awareness, no matter what your relationship. You'll learn how to hypnotize people in normal conversations. Turn each sentence into a hypnotic command with subliminal messages. That distract the conscious mind and fully engage the subconscious mind. So you'll be automatically speaking in hypnotic patterns	without any effort at all. People will instantly like you and be attracted to you, WANTING to do what you ask. Your prospects will practically be eating out of your hand. You'll get six hours of intensive, immersive, conversational hypnosis training with Certified Master Trainer Michael Stevenson, often regarded as one of the best hypnotists in the world. When we're finished, you'll be speaking hypnotically in everyday conversations, easily and effortlessly, as if you'd done it your whole life. Works in Person, Over Video Chat, On the Phone, In Written Notes and More! and unconscious minds. After becoming a trainer myself, I was quite surprised to discover how many of the things Michael had said to me and the stories he told in his live trainings were actually intentional multi-layered communications meant to influence me at an unconscious level. Covert Conversational Hypnosis Home Study Bonuses! Learn empowering mindsets from NLP that will lay the foundation for what you'll learn in this program. Create a positive success mindset with NLP! Whether you sell professionally or just want to be more convincing in your personal life, The Irresistible Elevator Pitch Formula will teach you how to create a riveting elevator pitch that will convince more people to buy from you. Elevator pitches are sales pitches that take a short amount of time -- about the time that it would take you to ride an elevator with a prospect. Using these tips, you'll be sealing deals and closing more sales than EVER before. Makes for a GREAT companion to the Covert Conversational Hypnosis Home Study and the Mastering the NLP Sales Process Home Study. This is an incredible value! No other trainer offers this combination of tools and services specifically designed to create your success with covert conversational hypnosis. Don't go through life hoping to achieve success. Don't let the boss, your child, the economy, society or anything else steal your chance at happiness, abundance and fulfillment. Make the choice today to create this opportunity for yourself to build the life you desire. This is about learning the skill to create the relationships to make your life magnificent. Enroll now! Yes, Michael, I want to learn Covert Conversational Hypnosis. I understand these are the same covert language patterns taught in your high-priced NLP and Hypnosis seminars and that this is a Time Limited Offer. Plus, I feel completely confident enrolling based on your reputation and the iron clad, money back guarantee. Sign me up now! The best-selling ebook, Learn Hypnosis... Now! Instant Access To the Course and These Bonuses! One Payment of $1200 Only $197 For a Limited Time! These trainings sell out fast! Act now for your early bird discount before this event fills up!